Hospital based programs dedicated to improving antibiotic use, commonly referred to as “Antimicrobial Stewardship Programs” (ASPs), can both optimize the treatment of infections and reduce adverse events associated with antibiotic use. Below we report the core elements of antibiotic stewardship. Antibiotic stewardship programs (ASP) have been shown to improve patient outcomes, reduce antimicrobial agent-related adverse events, and decrease antimicrobial resistance (AMR). 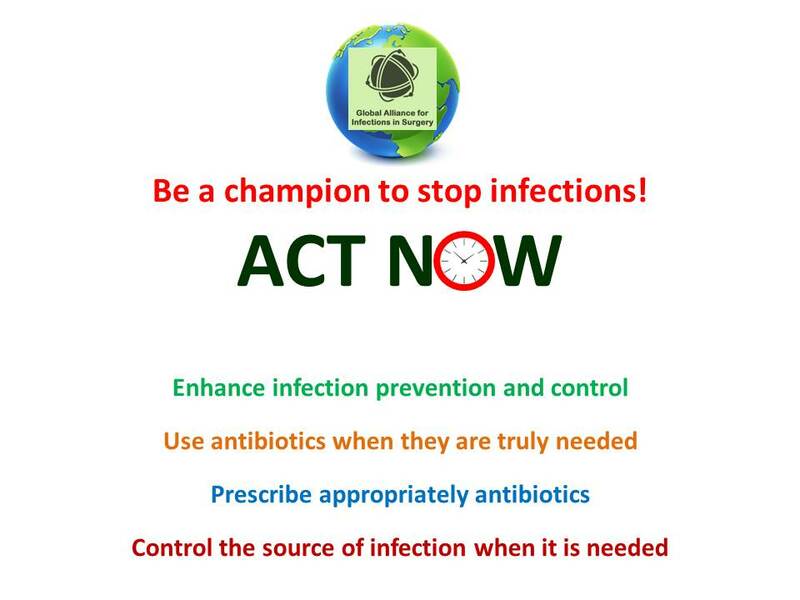 However, prevention is better than cure and it is important that all clinicians depend on evidence-based IPC interventions to reduce demand for antimicrobial agents by preventing healthcare associated infections from occurring in the first place, and making every effort to prevent transmission when they occur. The issues surrounding the prevention and control of infections are intrinsically linked with the issues associated with the use of antimicrobial agents and the proliferation and spread of AMR. The vital work of infection prevention and control (IPC) programs and ASPs cannot be performed independently and requires interdependent and coordinated action across multiple and overlapping disciplines and clinical settings. Appropriate source control is of outmost importance in the management of surgical infections. Intra-abdominal infections along with soft tissues infections are the sites where a source control is more feasible and more impactful. In these settings an appropriate source control can improve patients’ outcome and reduce antibiotic pressure allowing short course of antibiotic therapy. Antibiotics can be life-saving when treating bacterial infections but are often used inappropriately, specifically when unnecessary or when administered for excessive durations or without consideration of pharmacokinetic principles. Antibiotics should be used after a treatable infection has been recognized or when there is a high degree of suspicion for infection. Initial antimicrobial therapy in patients with surgical infections is typically empirical in nature because especially critically ill patients need immediate treatment, and microbiological data (culture and susceptibility results) usually requires ≥24 h for the identification of pathogens and antibiotic susceptibility patterns. Empirical antimicrobial therapy should be based on local epidemiology, individual patient risk factors for difficult to treat pathogens, clinical severity of infection, and infection source. Knowledge of local rates of resistance should be an essential component of the clinical decision-making process when deciding on which antimicrobial regimen to use for empiric treatment of infection. Every clinician starting empiric therapy should know the local epidemiology. Surveillance initiatives are important, both in a local and in a global context. Generally, the most important factors in predicting the presence of resistant pathogens in surgical infections is acquisition in a healthcare setting (particularly if the patient becomes infected in the ICU or has been hospitalized for more than 1 week), corticosteroid use, organ transplantation, baseline pulmonary or hepatic disease, and previous antibiotic therapy. Previous antibiotic therapy is one of the most important risk factors for resistant pathogens. Inappropriate therapy in critically ill patients may have a strong negative impact on outcome. An ineffective or inadequate antimicrobial regimen is one of the variables more strongly associated with unfavorable outcomes in critically ill patients. Broad empiric antimicrobial therapy should be started as soon as possible in patients with organ dysfunction (sepsis) and septic shock. Finally, selection of empirical therapy should take into account the infection source because etiological distribution varies according to the source site. The antibiotic dosing regimen should be established depending on host factors and properties of antimicrobial agents. Antibiotic pharmacodynamics integrates the complex relationship between organism susceptibility and patient pharmacokinetics. Pharmacokinetics describes the fundamental processes of absorption, distribution, metabolism, and elimination and the resulting concentration-versus-time profile of an agent administered in vivo. The achievement of appropriate target site concentrations of antibiotics is essential to eradicate the relevant pathogen. Suboptimal target site concentrations may have important clinical implications, and may explain therapeutic failures, in particular, for bacteria for which in vitro MICs are high. The patient should be reassessed when the results of microbiological testing are available. The results of microbiological testing may have great importance for the choice of therapeutic strategy of every patient, in particular in the adaptation of targeted antimicrobial treatment. They provide an opportunity to expand antimicrobial regimen if the initial choice was too narrow but also allow de-escalation of antimicrobial therapy if the empirical regimen was too broad. Duration of therapy should be shortened as much as possible unless there are special circumstances that require prolonging antimicrobial therapy such as immunosuppression, or ongoing infections. Oral antimicrobials, can substitute IV agents as soon as the patient is tolerating an oral diet so as to minimize the adverse effects which are associated with intravenous access devices. Where possible, conversion to oral antimicrobial agents having high oral bioavailability (e.g. fluoroquinolones) should be considered. Patients who have signs of sepsis beyond 5 to 7 days of treatment warrant aggressive diagnostic investigation to determine if an ongoing uncontrolled source of infection or antimicrobial treatment failure is present. In the management of critically ill patients with sepsis and septic shock clinical signs and symptoms as well as inflammatory response markers such as procalcitonin, although debatable, may assist in guiding antibiotic treatment. Education is fundamental to every ASP. A range of factors such as diagnostic uncertainty, fear of clinical failture, time pressure or organisational contexts can complicate prescribing decisions. However, due to cognitive dissonance (recognising that an action is necessary but not implementing it), changing prescribing behaviour is extremely challenging. Efforts to improve educational programs are thus required and this should preferably be complemented by active interventions such as prospective audits and feedback to clinicians to stimulate further change. It is also crucial to incorporate fundamental ASP and IPC principles in under- and post graduate training at medical faculties to equip young doctors and other healthcare professionals with the required confidence, skills and expertise in the field of antibiotic management. Monitoring of antibiotic consumption should be implemented and feedback provided to all ASP team members regularly along with AMR or healthcare-associated infections (HAIs) surveillance data and outcome measures. HAI is a patient safety and quality of healthcare issue which contributes to poor patient outcomes and additional costs to the health care system. Surveillance to determine the incidence of HAI is an important part of the strategy to minimise the occurrence of these infections. It is essential for an ASP to have at least one member who is an infectious diseases specialist. Pharmacists with advanced training or longstanding clinical experience in infectious diseases arealso key actors for the design and implementation of the stewardship program interventions. In any healthcare setting, a significant amount of energy should be spent on infection prevention and control. Infection control specialists and hospital epidemiologists should be always included in the ASPs to coordinate efforts on monitoring and preventing healthcare-associated infections. Microbiologists should actively guide the proper use of tests and the flow of laboratory results. Being involved in providing surveillance data on antimicrobial resistance, they should provide periodic reports on antimicrobial resistance data allowing the multidisciplinary team to determine the ongoing burden of antimicrobial resistance in the hospital. Moreover, timely and accurate reporting of microbiology susceptibility test results allows selection of more appropriate targeted therapy, and may help reduce broad-spectrum antimicrobial use. Surgeons with adequate knowledge in surgical infections and surgical anatomy when involved in ASPs may audit antibiotic prescriptions, provide feedback to the prescribers and integrate best practices of antimicrobial use among surgeons, and act as champions among colleagues implementing change within their own sphere of influence. Infections are the main factors contributing to mortality in intensive care units (ICU). Intensivists have a critical role in treating multidrug resistant organisms in ICUs in critically ill patients. They have a crucial role in prescribing antimicrobial agents for the most challenging patients and are at the forefront of a successful ASP. Emergency departments (EDs) represent a particularly important setting for addressing inappropriate antimicrobial prescribing practices, given the frequent use of antibiotics in this setting that sits at the interface of the community and the hospital. Therefore, also ED practitioners should be involved in the ASPs. Without adequate support from hospital administration, the ASP will be inadequate or inconsistent since the programs do not generate revenue. Engagement of hospital administration has been confirmed as a key factor for both developing and sustaining an ASP. Finally, an essential participant in antimicrobial stewardship who has been often unrecognized and underutilized is the “staff nurse.” Although the role of staff nurses has not formally been recognized in guidelines for implementing and operating ASPs they perform numerous functions that are integral to successful antimicrobial stewardship. Nurses are antibiotic first responders, central communicators, as well as 24-hour monitors of patient status.